My passion for the Kratom community runs deep. I have proudly served on the board of the Botanical Legal Defense, where we fought for many victories in defending plant’s rights in numerous states, where we each had to put up a large amount of our own money to get in the ring to fight. I even helped write the law in Illinois that prevented Kratom from becoming a Schedule I drug. That battle involved a road trip to the capital of Illinois with a fellow board member, where we shook hands with representatives, pleaded our case, and attended the vote regarding the Scheduling of Kratom to ensure it remained legal for those 18 and older to purchase. And that’s just one of the many victories we fought for as representatives of the Kratom community. That will always be something I’m extremely proud of. Ironically, I’ve spent a lot of time, energy, and money fighting for the very people who are now trying to hurt me and my business. Everyone has a right to their opinion, but I ask that you find out the facts and the truth for yourself before expressing those opinions and judgements. It was far easier back then; there were only a few main suppliers, and we all were watching what each other was doing. Now, though, the number of Kratom samples we receive for testing at Wonderland Labs has skyrocketed. In fact, in mid-2017, it skyrocketed so much, for a short while, we were unable to keep up with the workload. We quickly built an exceptional online system for tracking Kratom Samples and clients, with a Wonderland Client Dashboard that walks you through every step of the way. 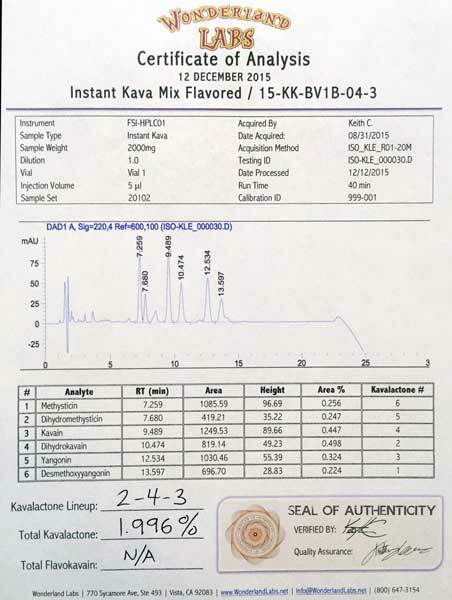 We built up our Kratom profiles, and got even more serious with our reference samples, our testing standards, and our redundancy checks for Kratom testing. We were determined to go above and beyond what any other lab could or would be willing to do for the price point we offered Kratom testing at our lab. I was warned about a few dark corners of the current Kratom community. I was warned that some parts of it may not be the community of kind, like-minded, and caring people that I was accustomed to over the past nearly twenty years. I was told there is a new negative, cutthroat energy, with a level of impatience, anger, and accusation like none of us who’ve been in the industry have seen before. I didn’t care, and I also didn’t believe it. It’s easy to make generalizations and put labels on people we’ve never met or spoken to personally. I have faith in the entheogen community as a whole, and have been an integral part of it for over many years. I tromped around the world looking for new entheogens to offer throughout the early 2000’s, spent a great deal of time with people like Dennis McKenna (brother of Terence McKenna). We shared Ayahuasca together in Peru, shared suppliers for many amazing plants, as I have with a number of amazing people in the entheogen community. It always felt like community based on mutual compassion and a sincere desire to seek our true nature through sacred plants. When I discovered Salvia, a community grew up around that Teacher Plant, and I was thrilled to be a part of that community as well. That turned into fighting for Salvia as it began to be scheduled across the USA. When I was introduced to Kratom by a friend in Indonesia who I had turned on to Salvia — I got nervous. I spent a great deal of time with Kratom, looking for the teacher in the plant. I took small doses up to large doses. There were virtually no Kratom vendors yet, so I was experimenting with extracts, resins, teas, infusions, and any other form that I could think to make it into. During that time, as I tried to understand the plant and what it was trying to offer, I took a few doses that were large enough to become psychoactive. It was important for me to know a plant inside and out before I made any judgements in relation to it. Personally, I never found that plant teacher in the plant. I did find very geometrical, industrial visions that felt like cement, viaducts, and coldness. More curiously, I found myself becoming agitated some of the time, while feeling like I was walking on clouds in others. I watched my overall attitude grow impatient the more I worked with the plant, and this agitation and impatience passed onto those around me, even my friends. I was worried that a community might spring up around this plant that had that same impatience and agitation. I was worried that there wouldn’t be the same kind of community that there was around all of the other sacred plants that I had been working with. I even thought to myself that this plant might become addictive for some people, instead of being something to help people with addictions. But, the wheels were in motion, and I was just a drop in the bucket with the small amounts I was selling. The least I could do was to try to market Kratom responsibly, to try to encourage responsible use. SEND ENOUGH MATERIAL: We have a detailed list of exactly how much material to send in our FAQ page. The entry is called “HOW MUCH DO I NEED TO SEND YOU?” If we’re not sent enough material to test, this stops everything. When more material is sent in, it needs to be clearly labeled, and with a Sample Submission Form, or this will stop all testing as well, since we will have no idea what the sample is for, especially with so many samples showing up on our doorstep on a daily basis. SEND WITH TRACKING: For those in a hurry, the sample must be sent via a method that has tracking. If there’s no trackable sample (USPS First Class and even USPS Delivery Confirmation is not tracking), there’s no way to guarantee the sample will arrive to us. We have seen those complain that we lose customer samples, but that is an outright false statement; we can proudly say that we’ve never lost any client samples in all the years we’ve been accepting samples. We provide an actual street address for returning clients instead of our PO Box to make even more certain samples are handled as quickly as possible. PACKAGE SAMPLES CORRECTLY: That is critical to successful Kratom sample submission with the lab. We discuss the proper way to package your sample on our FAQ page, and on the second page of the Sample Requisition Form. We explain this in “WHAT CONTAINER DO I SEND MY SAMPLES IN?” When instructions aren’t followed, samples can open in shipping, and all testing has to stop until we can get new, properly packaged samples from our clients. If those new samples don’t have a Sample Requisition Form with them, and are not clearly labeled, that will not only make our job difficult to impossible, it will stop the project in its tracks. It makes it extremely difficult on us when we have to try to track down samples and match them with their owners, when a simple inclusion of the Sample Requisition Form would resolve all of that. We’ve started a “AUTHENTICATE” page to explain how to spot a forgery, but to urge you to call us at 800-647-3154 to verify any Certificate of Analysis that you may have received or simply suspect is fake. We have reported two companies to the police already, and are still pursuing all legal means to stop any other people who choose to forge our documents. For anyone who reads this page or has found us from a post on a forum or on REDDIT, please take this 5% discount on our already low testing prices. “Write “GENUINE 5 PERCENT” on your Sample Submission form, send it to me in an email, or call us up and let us know that. For a one-time 25% discount on any ID/Percentage testing, just write “ID 25 PERCENT” on your Sample Submission Form, send it to me in an email, or call us up and let us know that. I’m doing my best to not lose faith in the current Kratom community. I know it’s just a few detractors, for whatever reason, who have chosen to target us. I do want to sincerely thank all of our loyal clients, both recent and ones who’ve been with us for years. Because of your loyalty we’ve been able to build extensive Kratom profiles for every known variety of Kratom that exists in the marketplace, or existed in the marketplace at one time. This helps us make variety determinations in a way that no other lab can. I’m so proud of all we’ve accomplished. I’m not some giant corporation that was given boatloads of money to build a facility. I took what I had made as a retailer in the entheogen marketplace, saved my money for nearly ten years, and then put everything I had into building the beautiful, beyond GMP-compliant facility that I have in Vista, CA. I made sure every detail was beyond required specifications to ensure that anything we wanted to do at the facility would follow the strictest standards, and would be something that everyone who work with and for us could be proud of. For the lab, our Wonderland Client Dashboard keeps you in constant communication with us, with invoicing, commenting, progress reports, and certificates all in one handy place. It’s been a huge success already. For now, we’re keeping Kratom testing on our menu, but our faith in some corners of the Kratom community has been shaken. We’ve been able to build a lab that I feel has the latest and most reliable technology, with results that are not padded to trick customers into coming back to us, and certificates that can be presented to the FDA with confidence. We have all of our loyal clients to thank for that, and for that we remain eternally grateful and will continue to do what we do with accuracy and passion regardless of what those trying to derail our efforts are hoping to accomplish.